Etanercept can be used both as monotherapy and in combination with methotrexate (MTX), but direct comparisons of these two options have not yet been reported. In order to compare the results seen in actual practice between these two options, clinical data on 97 patients followed in the Stockholm TNFα Follow-Up Registry were analysed. In 57 of these patients etanercept was added to previously started MTX while the others were treated with etanercept alone. The two groups had similar levels of disease activity at baseline. After 3 months, a significantly lower mean disease activity score (28-joint count-based disease activity score) was attained by the patients on etanercept plus MTX. In this group, the number of patients achieving European League Against Rheumatism-defined remission was also significantly greater. Other disease outcomes showed non-significant trends in the same direction. These data suggest that the combination of etanercept plus MTX is clinically more efficacious than etanercept alone. Etanercept (Enbrel) is effective in the treatment of rheumatoid arthritis both as monotherapy  and in combination with methotrexate (MTX) . Etanercept has been registered for use in either manner in most countries. While direct comparisons of etanercept as monotherapy with etanercept plus MTX have not yet been reported to date, but are currently being studied in a randomised clinical trial, longitudinal follow-up studies may provide additional information on the relative strengths of the two treatment options. The complex questions that govern clinical decision-making can rarely be addressed adequately using randomised trials . In such instances, structured longitudinal follow-up studies may have greater practical value. We now have at our disposal such a structured follow-up system for patients being treated with biological agents in the rheumatic diseases; namely, the Stockholm TNFα Follow-Up Registry (STURE) of patients treated with biological agents in Stockholm . We thus wished to utilise data from this registry to address the question of whether treatment with etanercept plus MTX was more efficacious in clinical practice than treatment with etanercept alone. The STURE database collects efficacy and safety data for all patients starting biological treatments at the major hospitals in Stockholm, as part of the nationwide registry of AntiRheumatic Therapies in Sweden. The assessments are performed at 0, 3, 6 and 12 months and annually thereafter. These assessments include the American College of Rheumatology core outcomes (the 28 swollen and tender joint count, the visual analogue scale [VAS] for global health and for pain, the health assessment questionnaire disability index, the erythrocyte sedimentation rate and C-reactive protein, and the physician's global assessment of disease activity), the 28-joint count-based disease activity score (DAS28) [5, 6], the record of concurrent medications, the employment status, and the side effects. While the STURE database is part of the AntiRheumatic Therapies in Sweden national biologicals safety registry, the present study was performed using only data collected and analysed at the Karolinska and Huddinge Hospitals. The STURE database is maintained in the RAMONA software package (Carmona, Halmstad, Sweden). Statistical analyses were carried out using StatView 5.0.1 for PC (SAS Institute Inc., Cary, NC, USA). For the purpose of the present study, data were analysed on 97 patients with rheumatoid arthritis treated with etanercept, 57 of whom were also treated with MTX. This group of 97 patients represented the first patient cohort in our registry, and all patients completed at least 6 months of treatment. The decision whether to use etanercept monotherapy or combination therapy with MTX was based solely on clinical considerations by the responsible physician. In the case of combination therapy, etanercept was added to prior treatment with MTX. Patients treated with combinations of other disease-modifying antirheumatic drugs plus etanercept were not included in this analysis. The mean MTX dosage in these combination-treated patients was 12.9 ± 0.4 (range 5–20, median 12.5), and the patients had received this treatment for at least 3 months. The baseline values in this patient group thus represent the definitive although insufficient responses to MTX. The baseline demographic and disease characteristics of all patients are presented in Table 1. The patients were comparable with respect to age, years of disease activity, rheumatoid factor positivity and shared epitope positivity. However, a somewhat higher proportion of patients were female in the group receiving combination therapy. The baseline disease activity for all patients is presented in Table 2. As can be seen, the patients receiving combination therapy had slightly lower disease activity values than those receiving etanercept alone, but only patient's assessment of pain by VAS showed a statistically significant difference. Values presented as mean ± standard error of the mean. Comparisons are by unpaired Student t test for continuous variables and by Fisher exact test for dichotomous variables. Values presented as mean ± standard error of the mean. Comparisons are by unpaired Student t test. ESR, erythrocyte sedimentation rate; HAQ, health assessment questionnaire disability index; patient global, patient assessment of global health by 100 mm visual analogue scale; patient pain, patient assessment of pain by 100 mm visual analogue scale; physician global, physician's assessment of global disease activity by five-point scale (0–4); SJC, swollen joint count (based on 28 joints); TJC, tender joint count (based on 28 joints). The DAS28 values following the initiation of etanercept therapy are shown in Fig. 1. A statistically significant decrease in disease activity is seen following inception of this therapy. This improvement is maintained during the 2-year follow-up period, consistent with data reported from clinical trials and other follow-up reports. As can be seen, while the baseline DAS28 values are similar in the two groups, patients receiving combination treatment attain lower DAS28 values at each of the subsequent time points, and the difference is statistically significant after 3 months. The absolute difference, however, is small. Disease activity score (28-joint count-based disease activity score [DAS28]) (mean ± standard error of the mean [SEM]) in patients with rheumatoid arthritis treated with etanercept with or without methotrexate (MTX). At 3 months, a significant difference is seen between the two groups (by unpaired Student t test). We also analysed the individual American College of Rheumatology components after 3 months and after 6 months. As can be seen in Table 3, the patient global assessment, the patient assessment of pain, and the physician global assessment all revealed statistically significantly better results for the combination therapy as compared with the monotherapy after 3 months. The other outcomes also favoured the combination therapy but did not reach statistical significance. A similar pattern emerged after 6 months (Table 4). The DAS28-based European League Against Rheumatism (EULAR) response criteria  were also compared. As shown in Fig. 2, the EULAR criteria for moderate/good response at 3 months and at 6 months did not show significant differences between the groups. At 3 months, however, the percentage of patients that achieved a EULAR-defined remission was significantly greater in the combination group than in the etanercept-only group. 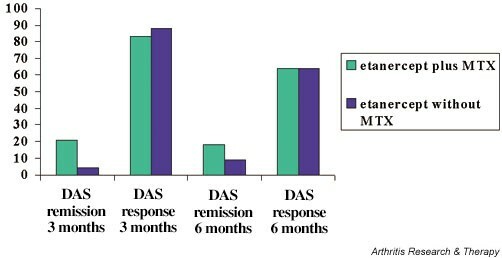 Disease activity score (DAS) response/remission after 3–6 months therapy with etanercept with or without methotrexate (MTX). Data are the percentages of patients achieving the European League Against Rheumatism criteria for moderate/good clinical response and for remission. We analysed the clinical responses to treatment with etanercept either as monotherapy or when added to baseline therapy with MTX. The present results show that the DAS28 values after 3 months were significantly better in the patients receiving combination therapy than in the etanercept-only patients, as were several of the core outcomes. A greater proportion achieved an EULAR-defined remission at 3 months. On the contrary, the absolute differences between the various outcomes in the two treatment groups were small and not all outcomes reached statistical significance. Group comparisons of this nature suffer from several weaknesses that can impact the results. First, the patient groups may be inherently different due to the lack of randomisation. We identified differences in the gender distribution between the groups, but correcting for this did not meaningfully change the results (data not shown). Disease activity parameters at baseline were well balanced in the two treatment groups, as were some of the known prognostic factors for clinical course (rheumatoid factor and shared epitope). One important difference between the two treatment groups, which cannot be eliminated, is the fact itself that the monotherapy group did not receive MTX. In all but a few instances this reflected prior treatment with MTX resulting either in treatment-limiting side effects or in a lack of efficacy. This may reflect on the nature of the patients' disease in a matter that cannot be captured otherwise and may thus have influenced the results. Specifically, studies by Choi and colleagues  and by Hurst and colleagues  have shown that patients treated with MTX have significant survival benefits compared with those treated with other antirheumatic agents. It has been suggested that patients with rheumatoid arthritis who are able to tolerate MTX represent a subset with better prognosis than those patients who cannot take MTX. A baseline imbalance also existed with respect to the patient's assessment of pain by VAS, which was significantly lower in the combination group. This imbalance weakens the importance of the difference seen in VAS pain at 3 months, and indeed a statistical comparison of the changes in VAS pain between the groups was not significant. With respect to the main outcome in this study, the DAS28, it is important to underscore that the VAS pain is not included in the formula for calculating the DAS28. In as much as any baseline imbalance in the outcome of interest would tend to bias towards finding a greater effect in the group with the higher baseline value (through regression to the mean ), the slightly higher disease activity indices in the monotherapy group actually strengthen the association between better treatment results and combination therapy. In view of our results with respect to DAS28 values and the core set of disease activity indices, it was somewhat surprising that the EULAR criteria for moderate/good response did not show a difference between the groups (whereas there was a significant difference for EULAR-defined remissions). This most probably reflects the small absolute magnitude of the difference between the DAS28 in the two groups, and confirms that dichotomous outcomes (responder indices) are less sensitive than continuous outcomes. We found no differences between the groups with respect to acute-phase reactants (the erythrocyte sedimentation rate [Table 3] and C-reactive protein revealed the same patterns [data not shown]). Generally, the tumour necrosis factor alpha blockers are very effective at reducing acute-phase reactants, which often normalise rapidly after initiation of these agents. One possible explanation why this study shows the least differences for the acute phase reactants could thus be that the effects of etanercept on this outcome are already maximal, making an additional effect of MTX much harder to detect. It is important to underscore that the comparison in this study is between, on the one hand, etanercept monotherapy initiated in patients who were not receiving disease-modifying antirheumatic drug therapy and, on the other hand, combination therapy where etanercept is added to established MTX therapy. This situation does not directly translate into a clinical decision-making point. 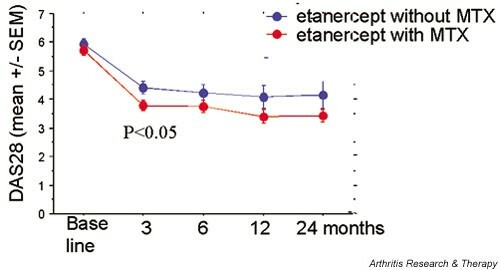 However, our results do suggest that, in patients who have an insufficient clinical response to MTX, the addition of etanercept to MTX may give better efficacy than instituting etanercept as monotherapy (i.e. switching from the one drug to the other). Our result would even suggest that, in patients receiving etanercept as monotherapy with only partially satisfactory responses, the addition of MTX might give additional clinical benefit. While many of these implications can and probably will be tested through randomised controlled trials, we believe that our data, derived from real-life treatment, could play a role of some importance in guiding physicians' decision-making processes. This work was supported by the Swedish Rheumatism Association. The authors have acted as consultants for, received grants from, and/or conducted clinical trials for Amgen, Wyeth and Immunex in the last 5 years.